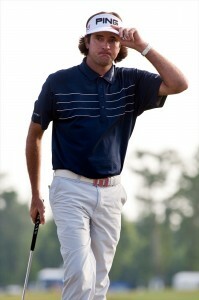 Bubba Watson wasn't the first with a miraculous escape from the trees on the 10th hole, but his shot netted a victory. Photo copyright John Korduner/Icon SMI. Louis Oosthuizen’s double eagle at Augusta National on Sunday conjured memories of Gene Sarazen’s “Shot Heard Round the World” in the 1935 Masters. Bubba Watson’s playoff shot on the 10th hole also had similarities with a great shot from the past, but one that has been forgotten. I only know about it from the research for my just-published book, Making the Masters: Bobby Jones and the Birth of America’s Greatest Golf Tournament. This shot, also an escape from the woods on the 10th hole, was struck in the first Masters of 1934 and was hit by Craig Wood. Wood entered the final round two strokes behind leader Horton Smith. What is now the 10th hole played as the first in 1934 because the nines were reversed, and Wood started by pushing his tee shot into the trees on the right. His attempted recovery hit a tree and bounced deeper into the forest. If you remember Watson’s situation, this sounds like what he would have faced on a direct line to the hole. But while Bubba had an opening toward the proper fairway, Harlow speculated that Wood would have to play backward to the adjacent ninth (18th by the current numbers), which would still leave him with a blind shot over trees but sufficient room to loft it over them. But Wood took out an 8-iron and aimed at the green. His shot somehow made it through the trees, hit on the embankment above the green, rolled down, and ended up an inch from the hole. “The crowd gasped in astonishment and then burst into a cheer,” Harlow wrote. “It was more than a million to one. You can go out there and play shots from that spot until you are too old to any longer swing the club and never get one as close to the hole as Wood’s ball.” Harlow, who later founded Golf World magazine, wasn’t prone to hyperbole, so we can take his account at face value. Watson’s hooked gap wedge from the trees to within 15 feet of the hole naturally gets greater points for importance because it basically won the tournament for him. But Wood’s shot was big, too, because it kept him in contention. Ultimately, he finished second, one stroke back. If he had made the double bogey, triple bogey—or even worse—that it looked like he was headed for, he might have finished fifth or sixth. It’s fair to say that Watson’s shot took more skill. His opening was toward the bunker in the fairway some 35 yards short of the green, so in order to reach the putting surface he had to make a wedge hook more than 40 yards while hitting it with control and avoiding some branches. It’s a shot that was not only beyond imagination for the average golfer, it was a shot that not even many pros could have pulled off. Wood didn’t have to curve his shot. He might have seen an opening that nobody else saw. Pros have a way of doing that. So it might have been a matter of skill to send the ball through that opening. But it’s possible that he decided to just hit and hope, and got lucky. The amazing thing is that on a shot that observers thought impossible, he not only hit the green but finished an inch from the hole! If Wood had won the tournament, his great escape would have been remembered as one of the greatest in Masters history. Instead, it fell into the dustbin of history. What’s more, Wood the very next year became the victim of the greatest shot in Masters history, perhaps the greatest shot in golf history. Gene Sarazen tied him by holing a 4-wood for a double eagle on the 15th hole of the final round, making up a three-stroke deficit with a single swing of the club. Sarazen went on to win in a playoff the next day, making Wood a runner-up in each of the first two Masters (he would win in 1941). Oosthuizen’s double eagle with a 4-iron from 253 downhill yards moved him into the lead. But it came much earlier in the final round, on the second hole. He and Sarazen both faced the problem—a welcome one—of trying to keep their composure after the double eagle and take care of the business at hand. Sarazen made those four-footers on the 17th and 18th holes and won a 36-hole playoff the next day by five strokes, so he was a hero instead of a mug. Oosthuizen had nearly a whole round to play, but he almost gave the lead right back. He didn’t look like himself on the next hole, No. 3, where he hit three awful shots before thankfully holing a 12-foot downhill putt for a par. “It was tough the next five holes to get my head around it and just play the course,” Oosthuizen said after the round. He didn’t make a birdie until the 13th hole, but managed to shoot a 69 and, like Sarazen, reach a playoff. This playoff was 34 holes shorter than the one in 1935, and Oosthuizen came out on the wrong side of it partly because of Watson’s shot for the ages (his own bogey on the second extra hole didn’t help). But his double eagle was seen by millions on television, so it won’t be forgotten.